Phyllis Jean Newsletter, Issue #004 -- More Options! End of Summer Shipping Sale! Read on to Find Out How to Get It! --Website Info: Robby (our website specialist) updates us on the latest website stuff, and explains the promo. The Duster historically was an overcoat of sorts. Hence the name "duster". It was an article of clothing that kept the ladies dust free when riding in a car, or doing chores around the house. After awhile it also became common to wear them around the house as lounge wear. That aspect of "lounge" is exactly what our Duster takes on. 1: Modesty! We will see that as we go on. 2: They are great for traveling...much lighter to pack than a heavy cotton robe. 3: Many options! We really put a ton of work into these to be able to offer you many different choices of prints. 4: Do you have a Grandma, or are one yourself? These provide excellent coverage for elderly in nursing homes or someone in a hospital, or simply at home. 6: After the baby arrives, these duster can be used as a nursing night gown because it has a very functional front zipper. 7: They have side pockets and elastic gathers at the sleeves so you can push your sleeves up as you wash dishes or grab a handful of cookies from the jar! 8: A good cover to throw over your clothes as you quickly run through the house "dusting your cares away!" 9: We are offering them at a great low price right now! 10: Can you see it? Flannel, a cup of tea, a crackling fire, and the cool fall air blowing the fall colors about outside. We have some new colors I will adding shortly to our line of ladies blouses and skirts! We have had people wanting more color, and more seasonal prints, so we are making it happen. If you have any comments on the slide shows and how everything works let me know. It seems to work pretty smoothly using You Tube. If you haven't noticed I am continuing to work on converting our inventory system. The new system displays a little different than before. So our new colors in skirts and blouses may look a little different on the store. Let's do a new poll! I need some input on the slide shows etc. I will post it after this Newsletter goes out. We are answering your call! Time for some fun new colors in our modest skirts! 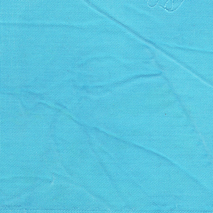 As a technical note: It is very difficult to present the true color of these fabrics or any fabric on the computer. I strive to give you as accurate a picture as I can, but there are many variables associated with what you, the customer, actually see. The variables are the scanner, then my monitor, then my photo editing software program, then the internet, then your computer, and then finally your monitor! To put it simply, if you are worried about what it actually looks like...buy a Bamboo Under-Blouse, a 100% Cotton Slip, etc., and we will send you a swatch! COLD IS COMING! GET Bamboooo! Take a break from the heat and imagine the cool cozy days ahead. We have what you need to keep the chills at bay. Do you know people who say they like to wear skirts but not during the winter months because of the weather, their legs are just too cold. We have designed the perfect solution,bamboo! Our leggings are pure softness. They go over your knee, about midcalf. We did this because with other leggings they sometimes go down past your skirt and look, well, silly. The pattern was made from a lady who used to design ski wear, and knows how to make clothes snug fitting yet comfortable. We offer fun colors with a cute ruffle, time to get rid of your blacks, grays, etc. Brighten up your winter. 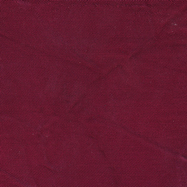 On top of the leggings we have some basic corduroy colors to pair up with your favorite sweaters. 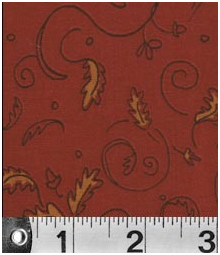 The pattern is the same, your favorite ten gore skirt in corduroy. What about on top you ask. Well, have you felt the coziness of our bamboo under blouses? With four soft colors to choose from you can keep warm and snug all winter long. 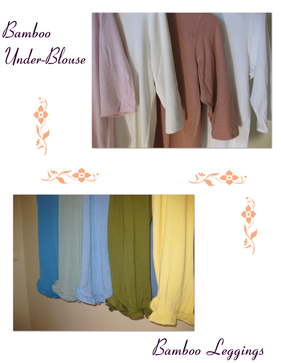 These underblouses are a perfect fit under our ladies blouses the sleeve comes to about the elbow.